Lune Necklace is a gold cloisonné enamel jewel created by Patsy Croft. It belongs to Holiday collection of amazing cloisonné jewelry with unique jewelry designs. Many of us enjoy natures best, such as butterflies. Here the Lune Necklace I have created is a cloisonné enamel jewel. 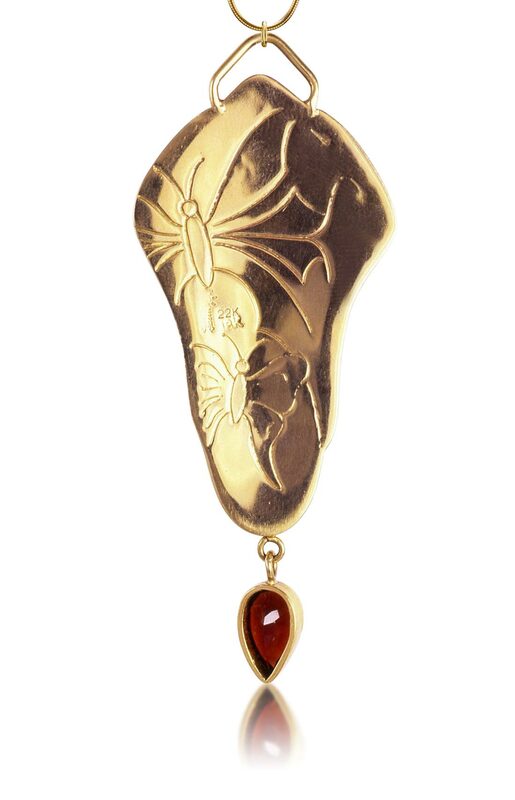 This one of a kind enameled butterfly, will be in the family forever, and enjoyed for generations to come. Cloisonné enamel jewelry as you know is my favorite enamel technique. 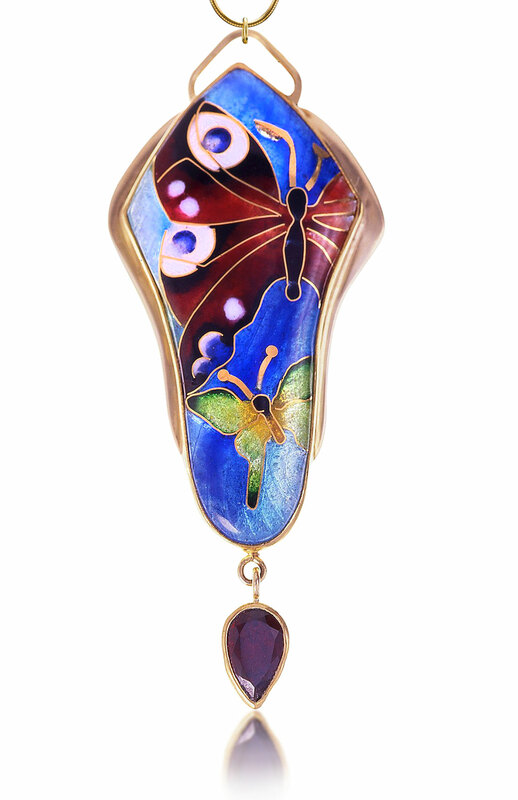 Check out “what is cloisonné” here to understand this beautiful art of enameling. Why would this be my favorite technique? As a young person drawing was my everyday love. It started with drawing cartons Mom would let us watch on Saturday mornings. Even though I explored many techniques in the art field I carried this love through public school and into college. We did not grow up with extras but there was always a pencil and paper around. So my art world was in black and white. And to no surprise Norman Rockwell was my favorite artist and so admired his amazing perfection. In college I graduated to pen and ink, mainly pointillism. So all the line drawing of cloisonné enamel fit my love of drawing. So, where did the color come in? Simple, I was fortunate to move to Hawaii, and the world of color opened my eyes!